Join over 2 million others using NodeBeat ! 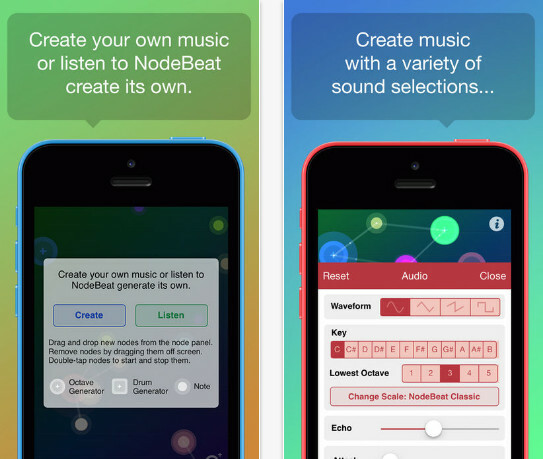 Make music with NodeBeat, the intuitive and fun visual music app for all ages. Whether you’re 2 or 92, NodeBeat will make you sound like a pro. Create your own music in a matter of minutes or listen to NodeBeat generate its own. Easily share your creations with others or save them for later to show your friends. Discover your musical genius with NodeBeat! – Audiobus support: Now you can stream live audio directly to other Audiobus-compatible apps! See http://audiob.us for more information.